Four 425-hp Yamahas push the Regulator 41 to a top-end speed of 62 mph. 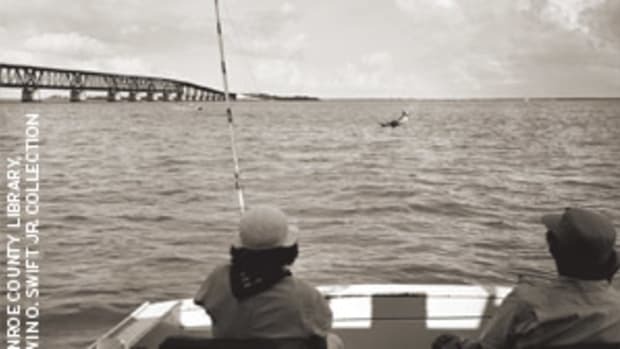 On a twisting canal leading to the North Fork of Florida’s St. Lucie River, there was barely room for sweat between bulkheads that were heavily lined with boats. And yet, the Regulator 41 idled through the canal with the ease of an eel. 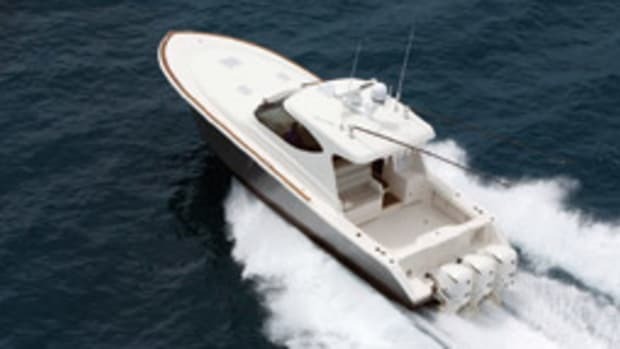 The flagship of Regulator’s fleet then ghosted into open water: It was eerily quiet, even with four Yamaha XF425 4-stroke outboards on the transom. The eel turned electric in a hurry. Less than 10 seconds after the throttles were pinned, the Regulator was running at 43 knots. It then ripped to a top speed of 54 knots, and it did so with full diesel and water tanks. At the helm was Jim Penix, sales manager at Sovereign Marine Group of Stuart, a Regulator dealer. He and I were eager to put the new-for-2019 model to the test. 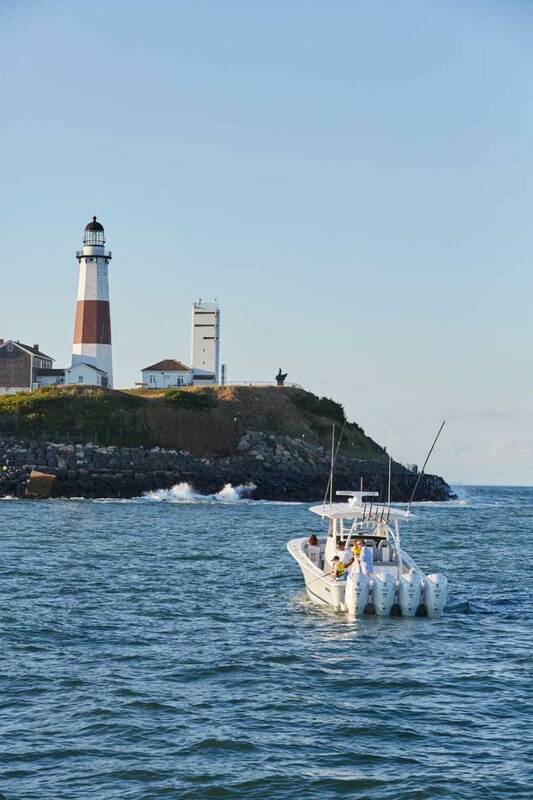 The North Carolina-based builder introduced the 41 a few years ago for fishing and day trips with the family and is now offering it with improved performance and updated features for offshore runs. Penix pulled back on the throttle and brought us to a 4000-rpm cruising speed, at which we recorded 35 knots and a fuel burn near 58 gph. Then, at 3700 rpm, the boat moved along at 30 knots. For fun, Penix brought the boat down to trolling speeds. There was a clean wash behind the transom. Penix and I agreed the boat should offer anglers a nice combination of wake alleys for dragging mullets and ballyhoo. “When trolling, I can reduce running time by shutting down a pair of engines and alternating them,” said Penix. 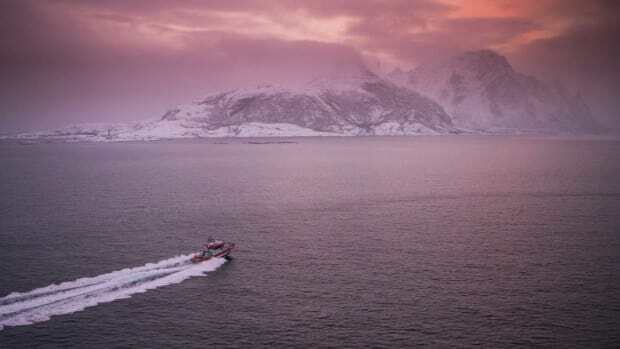 “This way, I’m only putting four hours instead of eight on the outboards and burning less fuel, too. The four-stroke outboards are mounted on an Armstrong bracket. 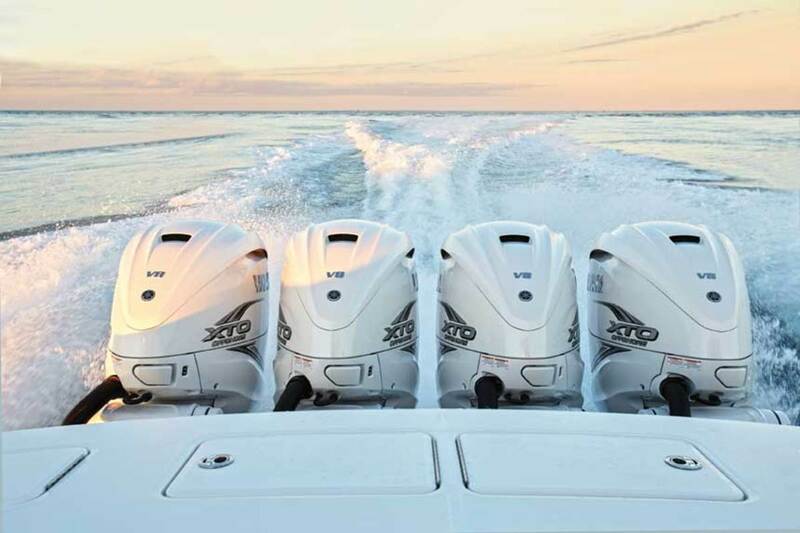 ”The previous version of the 41 had quad 350 Yamahas, which at the time (late 2015) were the largest outboards Yamaha offered; they delivered top speeds around 43 knots. What’s different about the new Yamahas goes beyond higher speeds; the propellers have a larger diameter and increased blade area to deliver more thrust, and they account for low-speed steering response. The inner outboards sport 35-inch shafts, which keep them deep in clear water to maximize bite. The Yamahas also have an exhaust system that diverts flow away from the propellers below 2500 rpm. 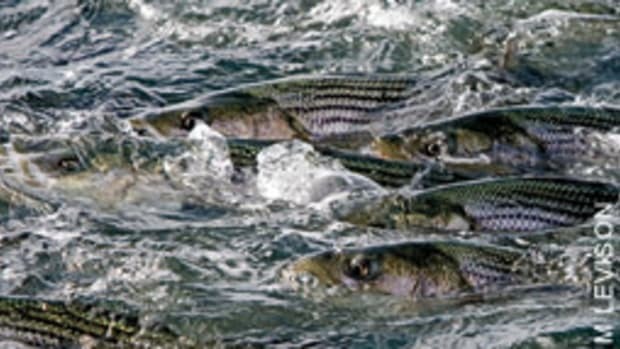 This increases thrust in reverse, a characteristic that comes in handy when docking or maneuvering to gain line on a fish. As we ran the boat along the coast, bow rise was minimal and visibility was excellent. The Yamaha power steering was feather light, but also tight and quick, with the joystick control creating a seamless response. 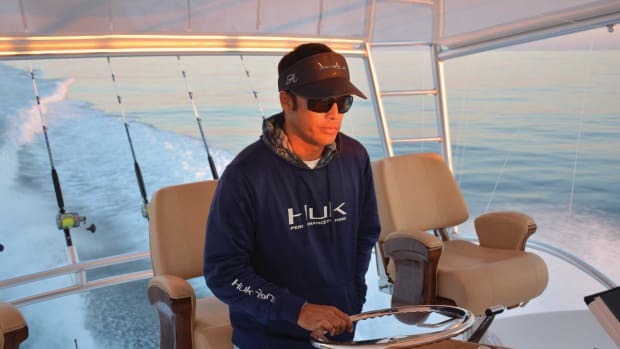 “I fish a lot of tournaments and with the joy stick and the integrated electronic steering on this Regulator, backing down on a fish is like driving a car in reverse,” said Penix. 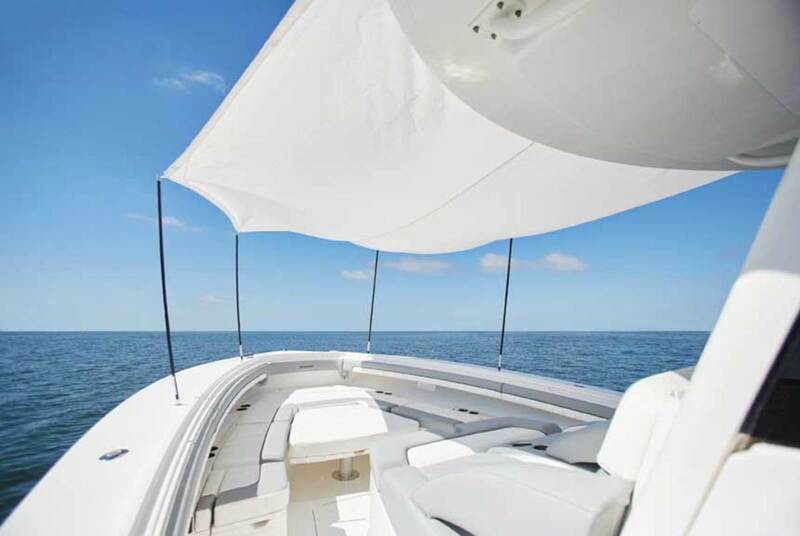 The newly modified, wraparound windshield diverted the breeze around the helm station and its three seats. A centerline vent kept us cool with a breeze, although air conditioning was available if needed. It comes standard with the boat. The Yamaha CL7 touch-screen display at the helm posted vital engine data, including speed, fuel burn, voltage and temperature. High-output alternators delivered 90-plus amps, with 58 amps at trolling speeds and up to 72 amps at around 1500 rpm. 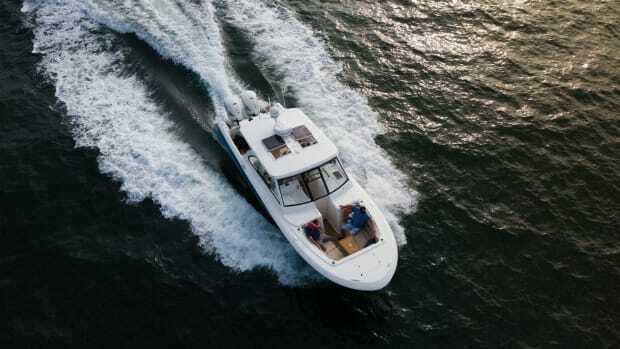 Feature-wise, additions to the previous version of the boat include an electric grill concealed in the seating console behind the helm, a Seakeeper 6 gyrostabilizer and a redesigned fiberglass hardtop. A SureShade extends from the hardtop over the cockpit, and a forward shade is available for the bow. The redesigned 41 has improved seats forward, a sleeker hardtop and a slide-out grilling station. Regulator’s signature pride in craftsmanship shows, from the stern to the bow. The fiberglass and mechanical work are top notch, there’s oversized hardware, and even the screw heads are perfectly aligned. Like its stablemates, the 41 is heavily built with a few major components: a solid fiberglass hull, a fiberglass stringer system bonded into the hull, a liner and the deck cap. The deep-V hull sports a transom deadrise of 24 degrees, which means a lot of it grips the water in various sea states and at different speeds. Sharpened chines and two pairs of running strakes provide lateral stability as the boat moves through the water. The Regulator 41 is better suited than ever for fishing. Freeboard in the cockpit averages 26 inches, and the reach to the waterline by the starboard boarding door is 31 inches—a convenient distance when the time comes to pull a fish over the side. Also in the cockpit are six flush-mounted rod holders, freshwater and saltwater washdown systems, a transom shower, a pair of 40-gallon illuminated livewells, coaming pads, tackle stowage and an insulated, refrigerated fishbox. The molded nonslip and built-in engine flush system should ease cleaning and maintenance. A gas-strut-supported lazarette hatch with deep gutters allows access to the 8-kW diesel generator, plumbing and fuel systems. Wire runs are neat and protected from chafe. The deck is one level, so there are no steps to trip over when moving forward and aft. 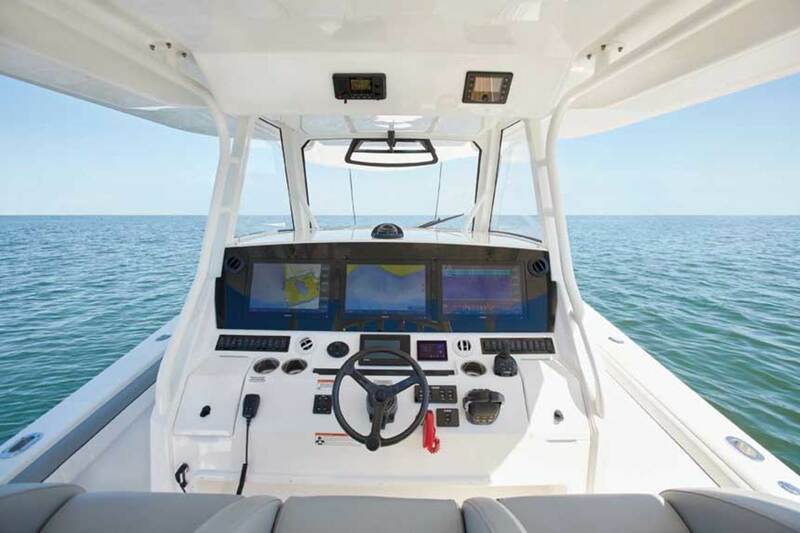 The decks on either side of the helm console are wide for tending dock lines or walking a fishing line around the boat. 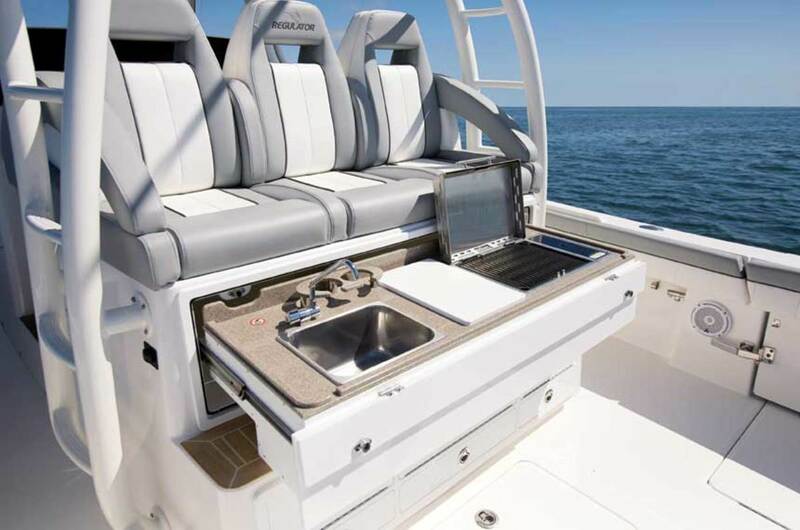 For guests, there are three aft-facing seats near the tackle center in the cockpit; this mezzanine-style seating is new for the 41 and the type of feature that families and fishermen will like. At the bow, seats are over a concealed, insulated cooler, and there’s a V-shape lounge with adjustable backrests. An electric pedestal table drops down to create a sunpad. When you’re ready to fish, the tabletop recesses flush with the deck. At the bow are another fish box, dry stowage and a recessed windlass compartment. The only wood aboard the 41 is in the cuddy cabin, where there’s cherry joinery and headroom of 7 feet. The cabin has been expanded in this updated 41. A dining table for four converts to a double berth. 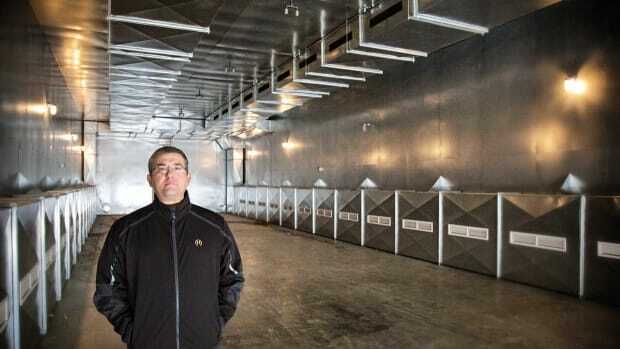 There’s also a galley and an air-conditioned head with a shower. A 28-inch, flat-screen TV and entertainment system are standard; LEDs and multiple portlights brighten the space. A new windshield design keeps the crew comfortable. Also in the cabin is good access to helm electronics and the windshield wiper mechanism, and there are safety features such as grabrails. 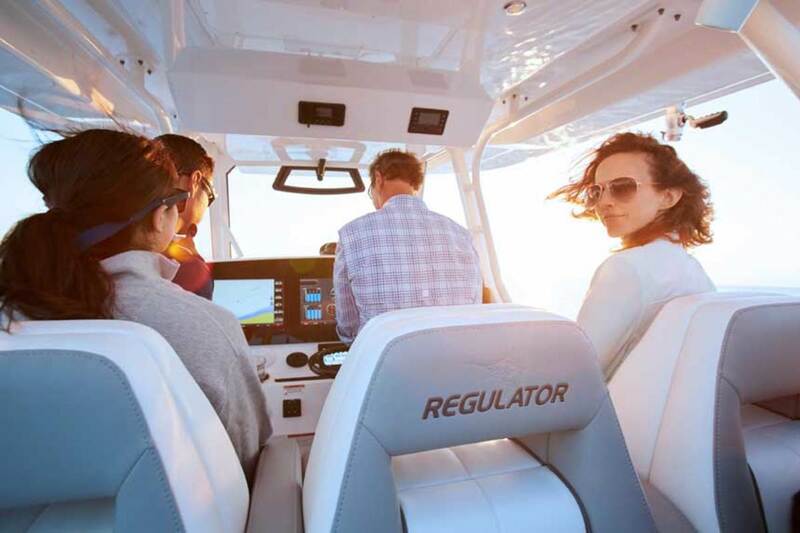 After discovering these details, I got the feeling that the folks at Regulator use their boats a lot and are always thinking about ways to make boating more convenient for their customers. 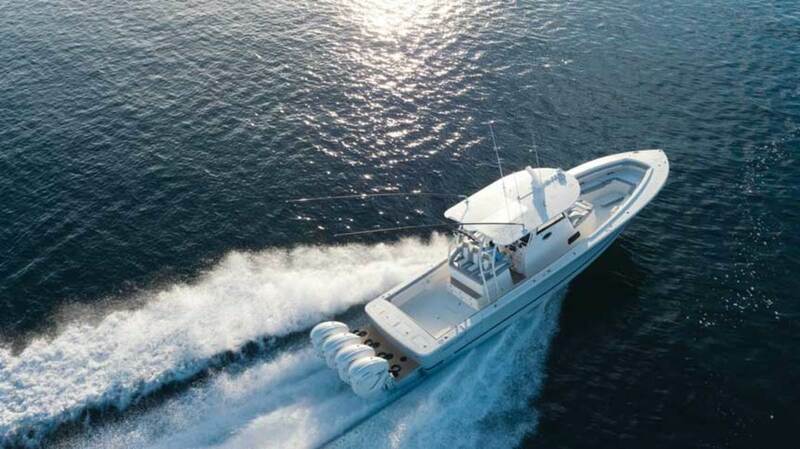 Whether those owners are competing in sailfish tournaments in the blue water off the Florida Keys or scouring the walls of the canyons in the Northeast for tough, big-eye tuna, they’ll discover this new flagship showcases Regulator’s commitment to building luxurious sportfishing boats that can go the distance.